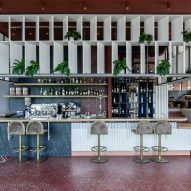 Ark4Lab of Architecture has used an assortment of red tones and clashing materials to create a "mosaic" of spaces inside this bar in northern Greece. Situated in the city of Kilkis, Lofos has been designed by Ark4Lab of Architecture to feature a harmonious medley of red, plum, and pink tones. 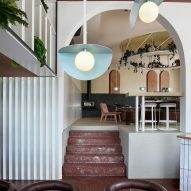 The cocktail bar occupies a 1970s building that is punctuated by large rectangular, pentagonal, and circular windows – the only feature which the studio opted to keep in its overhaul of the space. 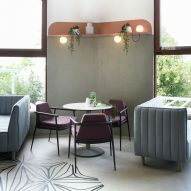 "Our main goal was to create a minimal and modern space without hiding its existing identity," George Tyrothoulakis, architect at Ark4Lab of Architecture, told Dezeen. 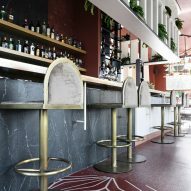 The main room is anchored by a huge bar counter that's fronted with veiny black marble, pale glossy tiles, and fluted white metal. Directly above sits two rows of open shelving, with leafy potted plants placed between its slanted dividers. Maroon paint has been applied to the ceiling to match the floor, which in some parts is flecked with white aggregate but in others features a flower-like pattern. Contrast is offered to the overall colour scheme by a series of pendant lamps, which appear as folded, sky-blue discs. 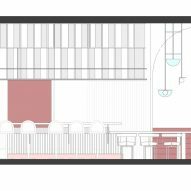 Floor-to-ceiling shelving has been erected in front of one of the windows, which offers counter space to customers sat on stool seats. Extra plum-hued armchairs and grey sofas have also been placed at the bar's peripheries. A short flight of stairs leads up through a vaulted opening to a further seating area, which has pale pink walls. 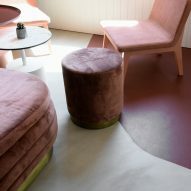 At the centre of the room is a burnt-red velvet seating booth, surrounded by blush-coloured chairs and brass-based poufs. Overhead hangs a ring-shaped shelf lined with plants that extends from a gold-painted depression in the ceiling. The lower half of the rear walls have been lined with black marble, while a trio of arch shapes has been painted on the upper half. 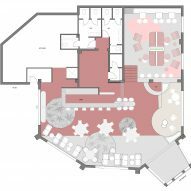 "The variation in colours and materiality – as well as the two-level division – blend [the bar] harmoniously into a mosaic of spaces, each one of them with a unique and distinguishable quality," added the studio. 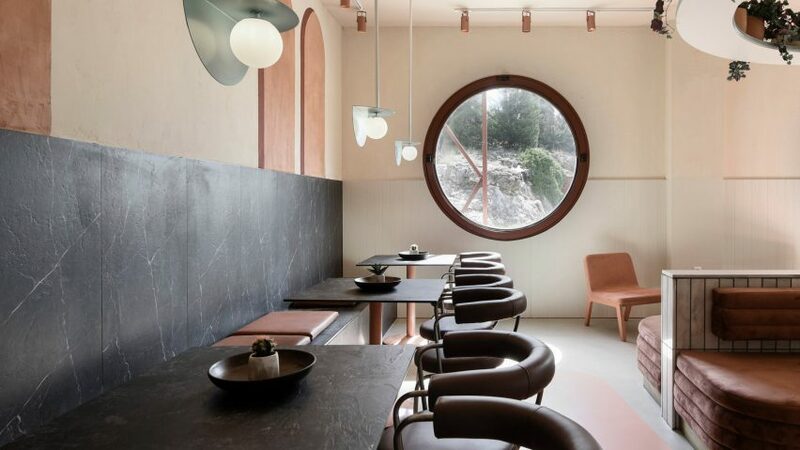 Much like Ark4Lab of Architecture, design studio Fluro introduced blush tones, marble fixtures, and velvet furnishings to the interiors of a bar in Athens. Bevelled glass partition walls inlaid with gold and spherical pendant lamps also help lend the space an art deco feel. Photography is by Nikos Vavdinoudis and Christos Dimitriou.